My AC is broken again. This is the third time, and it happens every four weeks. And it always happens on a Friday, so I can't get it serviced until Monday. Did I mention it has been almost 100 degrees every day lately? But I digress. In spite of my house becoming my own personal sauna, I had a GREAT time this weekend! Saturday, I met up with LC and JC for a girls' night out. We started out with a pitcher of refreshing sangria at Tapas by Anna in City Market. Then we had reservations to eat at Rocks on the River, the restaurant at The Bohemian. We started with the bruschetta, and I ate the Chicken Saltimbocca sandwich with their house pomme frites. The pepper jam on the sandwich's foccaccia bread was great. I also had the Glow Pop and Pomegranate Sunset martinis, both of which were delicious. The Glow Pop was my favorite, with Hypnotiq, vodka, and pineapple juice, topped with a little glowstick in the glass. We had the Praline Ice Box Cake for dessert, and it was so rich and good. The pralines were from the local candy kitchens, and that made it so much more "Savannah"! We got drinks at Rocks on the Roof afterwards, and then JC and I hopped around to some different locales... The Crypt Pub, Pour Larry's, and Savannah Smiles. 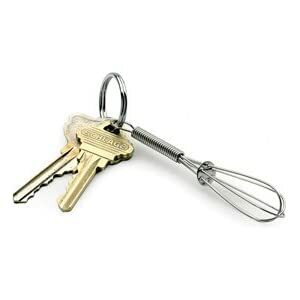 I bought a whisk keychain! If you're visiting Savannah and hope to visit some of these places, I HIGHLY RECOMMEND that you make reservations! It's so easy to use OpenTable. Even as a local, I make reservations so that I can enjoy the awesome cuisine Savannah has to offer. I can't tell you the number of times I've seen some angry tourist storm out of an awesome restaurant because they thought they could just walk in. Some of these places book up so fast, you're lucky to get a dinner table before 9 p.m. So do your homework and plan ahead! It was good to get "away" to Savannah, and enjoy a bit of the local flavor. It was also nice to find some air conditioning! Love spending time with my girlfriends.